The last standing State in the Southwest Nigeria, OSUN, is on the verge of escalation of religion crisis following the recent verdict of State High Court that hijabs be used in public schools which are not hitherto so. This must be addressed now. Already, the people resident in a peaceful ancient abode are saying the court is only playing the tune dictated to it by the state Governor, Rauf Aregbesola. 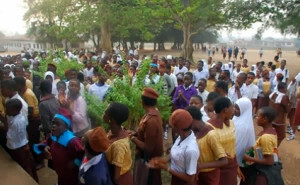 Now some students of Baptist High School, Adeeke, Iwo caused a stir among their colleagues as they appeared in the school in choir robes and other church garments. Our correspondent, who visited the school, observed that the students came late to the school around 8:35 on Tuesday and headed to their various classes as their colleagues hailed them for their courage. Many female Muslim students of the school wore hijab on their uniforms and some members of the Christian Association of Nigeria (CAN) are in the school to monitor the reaction of the teachers to the mode of dressing of their children. The CAN had held an emergency meeting following the judgment and threatened that it would direct Christian pupils to start wearing choir robes and other religious garments to schools should the state government implement the judgment.